A cranky pants Winx almost brought her stellar career to a premature end after lashing out with her hind legs and connecting with a fence at her media session this morning in the lead up to the 2019 Group 1 $4m Longines Queen Elizabeth Stakes (2000m) on Day Two of The Championships at Randwick on Saturday. Winx, above, has been given the all clear to run in the 2019 Queen Elizabeth Stakes after lashing out at a fence. Photo by Ultimate Racing Photos. Winx became quite agitated after trainer Chris Waller removed her ear muffs and rug and she showed a different side of her usually calm behavior when she kicked out on several occasions with one kick connecting with the enclosure fence. Waller was quick to make contact with the stable farrier who reported that Winx has sustained no damage to her back hoof. “The farrier’s already called and said she’s 100 percent but as you could see she’s ready to go, which is good for people to see, to show how much energy and how much life she’s got to offer,” Waller said. “Obviously it’s a big morning with a lot of cameras, people everywhere. They can get a bit fresh from time to time and she’s certainly ready to explode. “I shouldn’t have taken the ear muffs off this morning. I just wanted to take them off so you could all see her without the ear phones on but as soon as I did she could hear the clicking and the clacking (of the cameras) so I probably shouldn’t have done that. “It was, it was (a heart flutter). She had the rug on and it was grabbing her on the bum and I don’t think she liked that too much. Prior to her moment of madness, Hugh Bowman had put Winx through her final gallop in the lead up to her farewell race appearance in the Queen Elizabeth Stakes. Winx kicked off her 2019 Sydney Autumn Carnival campaign with a win in the Group 2 $250,000 The Star Apollo Stakes (1400m) at Randwick on February 16 followed by a win in the Group 1 $600,000 Chipping Norton Stakes (1600m) at Randwick again two weeks later. The champion mare then claimed her fourth win in the Group 1 $1m George Ryder Stakes (1500m) at Rosehill on March 23 as her final lead up run into the Queen Elizabeth Stakes. 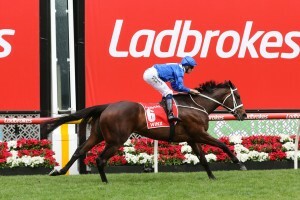 Winx will jump from the outside gate in the nine horse field as she chases her thirty-third straight victory and her twenty-fifth Group 1 winning trophy and is very short priced favourite at $1.06 at Ladbrokes.com.au to win her third Queen Elizabeth Stakes. The post Cranky pants Winx given the all clear for swansong in 2019 Queen Elizabeth Stakes appeared first on HorseRacing.com.au.